Back up your important data with this SanDisk flash drive, which allows you to store and transfer media between your phone and computer. The USB 3.0 and lightning connectors let you grab photos, contacts and more from your iPhone® and store it safely on your computer. iXpand mobile storage USB/lightning backup allows you to move photos and videos from your iPhone to free up space. USB 3.0 and lightning connectors allow high-speed media transfers from your computer to your phone and back. Flexible connector design can fit through most iPhone cases. iXpand 32GB flash drive holds your files. 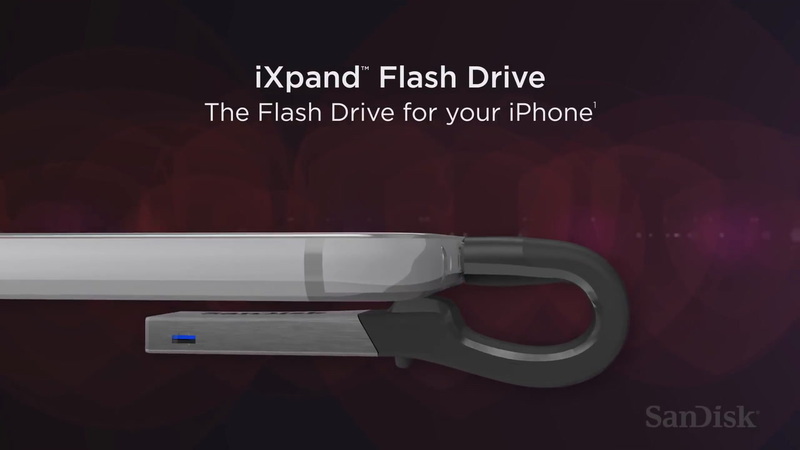 Free up space on your iPhone or iPad quickly and easily with the iXpand™ Flash Drive1. Plug in the Lightning connector and you can easily move photos, videos and other files off your device and onto the drive. From there, you can transfer the files onto a PC or Mac computer or store them on the drive. Set the iXpand™ Drive app to automatically back up your iPhone or iPad camera roll anytime the drive is connected2. No need to manually select which photos and videos to back up. Every time you plug it in, it does the work for you. The iXpand™ Flash Drive supports popular video formats so you and your family can store and watch your favourite videos straight from the drive via your device3. Or if you prefer view photos and enjoy music on the go. The iXpand™ Drive app makes it easy to manage photos and videos and also enables you to watch popular video formats3 directly from the drive. • Includes encryption software that lets you password-protect files so you can share content from your iXpand™ Flash Drive while keeping sensitive files secure across your devices4. .MP4 and .MOV as supported in iOS. DRM-protected content cannot be streamed. Check with the content provider for playback restrictions. The amount of capacity you need depends on the type of files you have, how big they are, and how many there are. The chart gives you an idea of how many photos, videos, music and office files you can store for each capacity. 2 Available for download from the App Store. iOS 8.2 required. Setup automatic backup within app settings. 3 Support for .MP4 and .MOV as supported in iOS. DRM-protected content cannot be streamed. Check with the content provider for playback restrictions. 4 Password protection uses 128-bit AES encryption and is supported by iOS 8.2, Mac OS X v10.8, Windows VistaÂ®, WindowsÂ® 7, Windows 8 and Windows 10. © 2018 Western Digital Corporation or its affiliates. All rights reserved. SanDisk and iXpand are registered trademarks of Western Digital Corporation or its affiliates in the United States and/or other countries. Apple, the Apple logo, iPhone, iPad, iPad Air, iPad mini and iPod are trademarks of Apple Inc. registered in the U.S. and other countries. App Store is a service mark of Apple Inc. All other marks are the property of their respective owners.